Protect your property rights by pooling your resources with other community owners to fully fund WMA’s two PACs. WMA has two separate PACs to fight two different kinds of battles. WMA’s Candidate PAC helps elect those who write legislation or ordinances impacting community owners. WMA’s Issues PAC finances ballot measure campaigns against rent control and other efforts to take away your property rights. Oppose Rent Control Measures. WMA’s PAC works with local community owners to referend or defeat rent control ordinances. WMA’s PACs oppose measures that could force you to sell your community for less than it is worth. WMA’s PACs have repeatedly led the fight to protect your property rights. WMA’s PAC funded studies to debunk the myth that community residents vote as a bloc and used them to persuade elected officials to keep an open mind on community issues. WMA’s two PACs can effectively combat the noisy grass-roots campaigns organized by resident groups. Sitting on the sidelines means letting rent control and right of first refusal laws proponents have undue influence on lawmakers. Protect your property rights by pooling your resources with other community owners to fully fund WMA’s two PACs. Questions? Call us at 916.448.7002, or send us message through the contact form on this page. WMA has two separate PACs to fight two different kinds of battles. WMA’s candidates PAC helps elect those who write legislation or ordinances impacting community owners. WMA’s Issues PAC finances ballot measure campaigns against rent control and other efforts to take away your property rights. What should my community contribute? A penny a day, per space, is the suggested amount per community. $3 per space for WMA Candidates PAC, and 1$ per space for WMA Issues PAC. WMA PAC Opposes policies that could cost community owners millions of dollars. See how WMA’s PAC Protects your property rights. Why should I give to WMA PAC? See what industry leaders are saying about WMA PAC (main PAC page). WMA partners with other business groups bring more value to your contribution. How do I contribute to WMA PAC? If you have further questions or need more assistance, please call us at 916.448.7002, or send us an email using the contact form on this page. 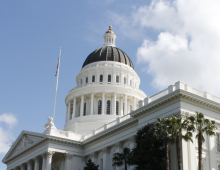 Find and track bills, and search California laws all on one site!